Bat alert and ready to go after warming up. 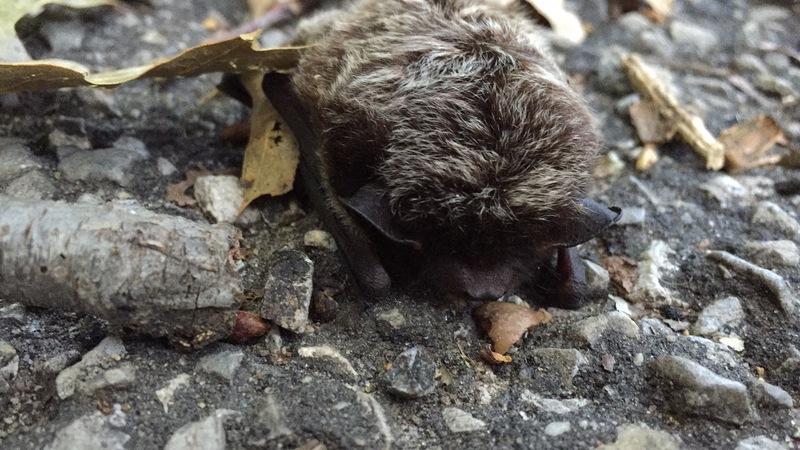 Bats in New York City are falling wearily onto sidewalks in our recent sudden cold spell. This morning I found one–at first mistaking the gray fur for a dead mouse. I got sticks to move it out of the pathway chopsticks-style. And then the poor thing started hissing at me. A completely empty threat as it was still too weak to get up. I picked the bat up in a plastic bag–as a dog owner, I always have plenty–and brought it to warm up in the sun. Still nothing. I carried the bat home in one hand and pushed the stroller and held the beagle leash in the other. I was afraid to put the bat bag in my pocket because I could either suffocate the bat or end up having to reach into a pocket with a bat. 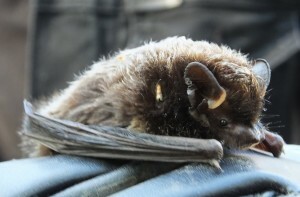 In New York bats are a rabies vector species–meaning they potentially carry the disease. I would need a higher grade wildlife rehabilitator license to take care of one, but that wasn’t my intention. I just wanted to foist it off on someone qualified or get instructions on a quick release. I reached out to some wildlife rehabilitators. Seemingly dead bat. Don’t pick one up with your bare hands. Meanwhile, I warmed up the bat under an incandescent bulb. I went looking for bugs, lacking mealworms, the preferred food of captive bats. My daughter Ginger, 4, eagerly helped me hunt for spider webs and then, failing that, collect acorns to soak to find weevils. No luck. My poor cleaning habits paid off: inside a light fixture I found dead bugs. I added them to warm honey water and served them up on a straw. The bat grabbed and licked the straw. And then she or he started to feel better, began climbing around. Right now I’m reading the educational and entertaining book The Secret Life of Bats by Merlin Tuttle, the bat man of Austin. He tells of learning to become a professional-level photographer to get pictures out of bats that weren’t terrifying. As the tiny bat hissed and chomped its tiny teeth, I thought of his difficulties. I would need a lot more time to get to see this bat’s sweeter side, but it’s best to move the wildlife back to the wild quickly. Marty Bast, effectively the game keeper of Brooklyn’s Prospect Park, offered to release her properly once she warmed up. He said this was the third bat found in this sleepy, cold torpor on the ground in the last two weeks. People often think they’re dead and go to pick them up with bare hands, then get bit. That leads to these bats getting euthanized and the person getting preventative rabies vaccines. Not only does the cold slow them down, it reduces the number of insects out there for them to eat. New York has nine bat species. I’m not sure if this one was a little brown bat (which hibernates in caves) or a silver-haired bat (Lasyionicterius noctivagans) which migrates. If the bat hits a tree and falls, they can’t take off again from the ground. So, you release them on a tree, not on the ground. Bast found a sunny tree near where I’d found the bat a couple hours earlier. He removed her from my cage with special bite-proof gloves. She quickly but awkwardly climbed up the tree to safety. When he gets calls for a live bat not moving on the ground, he warms them up and lets them go.